The successful extension of the tourism season in Ballina and north Mayo is evident in the latest figures from the local tourist office. Details of visitor numbers to Ballina Tourist Office on Lower Pearse Street throughout 2018 show there was an overall increase of 26% on the 2017 figures. Some 7,778 people called into the office in 2017 and last year there were 9,773 callers. It’s very encouraging news as this is the second year in a row that the facility has recorded a significant jump in visitor numbers with the 2017 total representing a 67% increase on the figures for 2016. 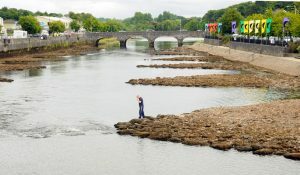 July — when Ballina’s renowned week-long annual Salmon Festival is held — remains the strongest performing month in terms of visitor numbers at the tourist office. Some 2,261 people called to the office to obtain information during that month last year, a 12% jump on the numbers for the corresponding period in 2017. Mags Downey-Martin, manager of Ballina Chamber of Commerce and Ballina Tourist Office, told the Western People that the figures for June and September of last year were particularly pleasing. June was the next best performing month with 1,403 visitors recorded at Ballina Tourist Office, representing a whopping 80% increase on the corresponding period in 2017. Ms Downey-Martin remarked that there was also a 69% growth in visitor numbers to the tourist office in September 2018. Anne-Marie Flynn, manager of the Mayo North Promotions Office, said the positive figures also endorse the recent decision to relocate all of the local tourism-related bodies into a central office on Lower Pearse Street. “It’s indicative too of a wider trend of visitors coming to Ballina because of the Wild Atlantic Way and many other activities we have undertaken locally,” she said.